A Jefferson Parish judge on Tuesday (Sept. 4) ordered a presentencing investigation after Olivia Matte pleaded guilty to causing the death of a Mississippi man as a result of driving while intoxicated on the Lake Pontchartrain Causeway last year. On what was scheduled to be her trial date, Matte, 28, of Covington, pleaded guilty as charged to vehicular homicide, a felony, in the March 23, 2017 death of James Blackmond, 37, of Foxworth, Miss. Matte also pleaded guilty as charged to vehicular negligent injuring, involving Blackmond’s 44-year-old passenger; failing to maintain control of a motor vehicle; and operating a vehicle while her driver’s license was suspended. Those charges are misdemeanors. Matte’s blood-alcohol content was .216, close to three times higher than the legal limit to drive in Louisiana. In accepting her guilty plea, Judge Glenn Ansardi of the 24th Judicial District Court granted Matte’s attorney’s request for a presentence investigation. Judge Ansardi allowed Matte to remain free on bond, denying the prosecutors’ request that she be remanded to jail while awaiting her sentencing. Judge Ansardi will announce Matte’s sentence on Nov. 15. A Gretna man was sentenced to 20 years in prison on Tuesday (May 10) after pleading guilty to killing a Carnival float tractor driver in Marrero while driving drunk. Michael Burrle, 56, pleaded guilty as charged to vehicular homicide and reckless operation of a motor vehicle in connection with the Feb. 7, 2015, collision at Lapalco Boulevard and Paxton Street. Burrle admitted he caused the death of Don Dauzat, 53, of Westwego, who was driving the tractor he used to pull a float in a Metairie parade the night before. At the time of the collision, Burrle’s blood-alcohol content was .12 percent, which is 50 percent above the legal limit to drive. He was speeding westward on Lapalco just before 3 a.m., in a 2001 Ford Explorer, when he ran the red light at Paxton, according to the Jefferson Parish Sheriff’s Office. Dauzat, meanwhile, was in a convoy of tractors and had just turned onto Lapalco from Paxton when the 2012 John Deere he was driving was struck by Burrle’s sports-utility vehicle. The impact sent the tractor rolling about 70 feet, and Dauzat was ejected. Dauzat died from his injuries at a hospital later that day. Burrle was arrested at the scene. Dauzat was among the tractor drivers who pulled floats in the Krewe of Excalibur parade the night before and had just dropped off the floats at a den in Marrero. The drivers, including Dauzat, were driving the tractors in a convoy to a staging area for another parade scheduled for the following night when Burrle caused the fatal collision. In impact testimony given during the plea hearing Tuesday, Dauzat’s daughter Courtney Dauzat called her father “my protector, comforter, friend and my hero.” She recounted how her father taught her to ride a bike, to “properly cast a fishing pole,” to check the air in her tires and many other things. “My father taught me a lot about how to have faith in God and how to love others,” she testified. “That night I lost the man who was supposed to walk me down the aisle on my wedding day, a day that every daughter looks forward to. I lost the man I felt safest with. Dauzat’s goddaughter, Lindsey Seibert, was among the family and friends who wrote letters to the court. A prosecutor read hers aloud. “Don did what he could to be a protector, a supporter, a husband, a friend, a son, a brother, a dedicated safety coordinator at Monsanto,” Seibert wrote. “He did a damn good job at all of those things and many more. “We need more people in the world like Don, and unfortunately, we lost one too early that night. His kindness and happiness will live on in our hearts forever, but sometimes it just doesn’t feel like it’s enough,” Seibert wrote. In accepting the negotiated pleas, Judge Ray Steib of the 24th Judicial District Court sentenced Burrle to 20 years in prison for the vehicular homicide and 90 days for the reckless operation offense. Steib additionally ordered Burrle to pay a $2,000 fine. A Grand Isle commercial fisherman with six actual convictions of driving under the influence was sentenced on Friday (May 6) to 20 years in prison for his most recent DUI conviction. Rockey Burnham, 44, was convicted as charged of his second fourth-offense DUI on April 20. 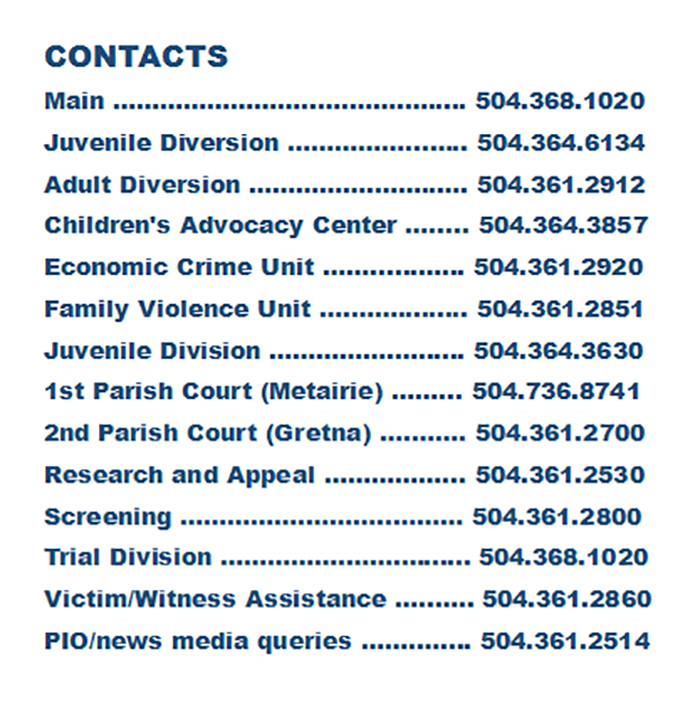 Fourth-offense DUI is the most serious offense available to prosecutors under Louisiana law. Burnham was arrested on April 28, 2015, after he crashed a boat he was piloting into moored vessels and the shrimp dock owned by Dean Blanchard Seafood. The U.S. Coast Guard investigated the boat wreck, while the Louisiana Department of Wildlife and Fisheries handled the DUI investigation. The state agents concluded that Burnham did poorly on the field sobriety test, leading to blood work that yielded the presence of diazepam, nordiazepam and methamphetamine, according to evidence presented at the trial. Fourth-offense DUI conviction carries a sentence of 10 years to 30 years in prison. After denying defense requests to toss out the conviction and to order a new trial, Judge Conn Regan of the 24th Judicial District Court opted for the 20-year sentence, to be served without the benefit of parole, probation or suspended sentence. Because he was on probation at the time of his arrest in this last case, Burnham faces an additional seven years if his probation is revoked. Five of those years are tied to a previous DUI conviction, while two are from a narcotics possession conviction. If his probation is revoked, Burnham would face the seven-year sentence in addition to the 20 years he received on Friday. Burnham denied the latest charges. He alleged the boat he was maneuvering suffered from mechanical problems and that Wildlife and Fisheries agents did little to no investigating. The Jefferson Parish jury deliberated about 40 minutes in finding him guilty as charged. His last conviction before this year’s was in 2011, for an arrest a year earlier for driving a trawler without authorization while under the influence of alcohol and crystal methamphetamine, crashing it into a dock. He pleaded guilty to DUI, unauthorized use of a movable and simple criminal damage to property. As part of the plea arrangement in that case, a judge sentenced him to 10 years in prison but suspended five of those years in ordering five years of probation. Burnham also was ordered to pay a $5,000 fine. He also was sentenced to two years in prison in 2011, for two narcotics-related offenses. He separately has DUI convictions in East Baton Rouge and Lafourche parishes, in addition to Jefferson Parish convictions. Assistant District Attorneys Lynn Schiffman and Marko Marjanovic prosecuted the case.